Note: There will be a plastic trim piece covering one nut and one bolt. These pieces can be easily removed by pulling them off by hand. 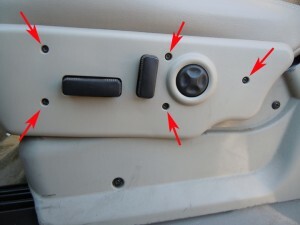 When these nuts and bolts are completely removed, and before you disconnect the power from the floorboard, move the seat half way forward (or back) until it is roughly in the middle position of the power track. Also, raise the bottom seat pan up as high is it will go (this will give you more clearance to get to all of the connections later). 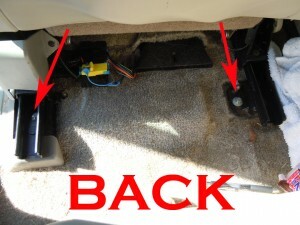 Next, lift the back of the seat up and disconnect the power and airbag (if applicable) plugs from the floorboard. THIS WILL NOT SET OFF THE AIRBAG. The picture below shows these 2 connections. 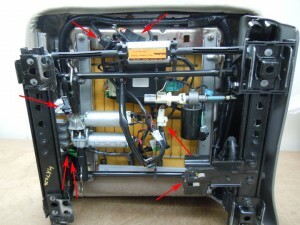 The black connection is the seat power, and the yellow connection is the airbag. 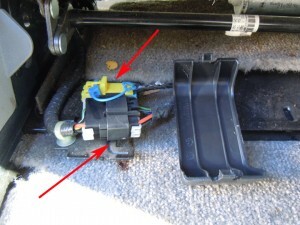 Both of these plugs can be disconnected by hand, though the yellow airbag plug will have an extra blue plastic safety pin on it. 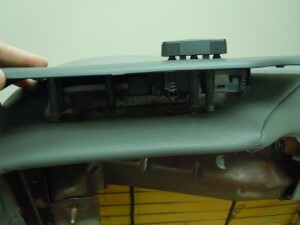 Note: There may be a black plastic trim piece covering these connections (shown above) that can be removed by hand. Lift the seat out of the vehicle, and place on a solid table or workbench. Note: The number and location of connections can vary slightly depending on the year and power options of the vehicle. The connections shown above may be slightly different than your seat. With the 13 mm nuts removed, and the power connections unplugged, the seat bottom can be separated from the frame. There are 2 plastic tabs on the back of the seat pan that hold the seat bottom to the frame. These tabs fasten to cut out channels in the seat frame (shown below). Slide the metal seat pan upward to “unlock” these plastic tabs from their cut out channels. 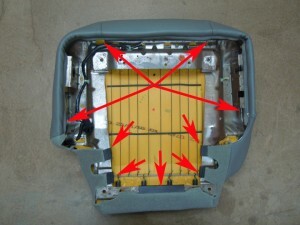 If you have missed an electric connection, you will not be able to completely separate the seat pan from the frame. Step 3: To remove the leather cover, start by taking off the plastic J clips that fasten the upholstered cover to the metal seat pan. There will be 5 J clips at the back of the seat, and 1 long one that runs around the front of the cover (shown below). Use a flat head screwdriver to help undo these J clips. Be very careful not to cut yourself on the metal seat pan, it is very sharp. With the J clips undone from the seat pan, unroll the leather cover off inside out, starting at one of the front corners, and then unrolling the back. 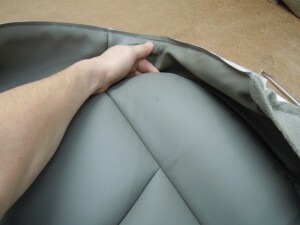 This cover attaches to the top of the foam cushion with Velcro. Slowly start pulling the Velcro apart by pulling up on the cover and pushing down on the Velcro that is glued to the foam cushion. It is very easy to pull the Velcro off of the foam if you are not pushing down on it. If you do happen to pull some of it off of the foam, use some 3M spray adhesive to glue the Velcro strip back down to the foam cushion. 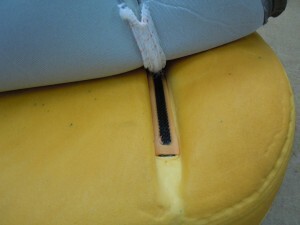 The picture below shows the Velcro on both the cover and the foam cushion. 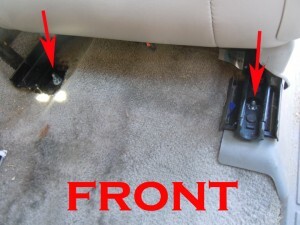 If you have seat heaters, you will see the heating element attached to the foam cushion. If you are replacing the foam cushion, you will need to peel the heating element off of the original foam, and glue it to the new foam cushion using a little bit of 3M spray adhesive. Do not spray the adhesive to the whole heating element, just the areas that were adhered to the old foam cushion. 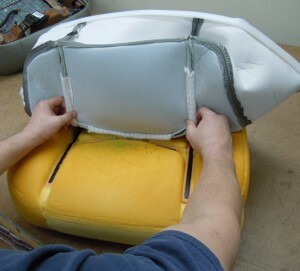 Step 4: To install the new leather replacement cover, fold the replacement cover inside out and align the Velcro on the cover with the Velcro strips that are attached to the foam cushion (shown below). Using your hand, press firmly down on all of the seams to securely fasten the Velcro together. A good Velcro connection is what will give your new seat cover the factory defined look. The next step is to start wrapping the leather around the foam cushion. Start at one of the front corners. Place your hand inside the cover and start rolling the cover down (shown below). It also may help to push in the foam cushion from the outside while you are rolling the cover down. Once that corner is set, move to the other front corner and do the same. Then move to the back of the cover and roll the carpet material over the foam cushion and metal seat pan. If the cover looks too far forward or backward, use this time to un-Velcro the cover from the foam cushion and adjust it whichever way you need to. 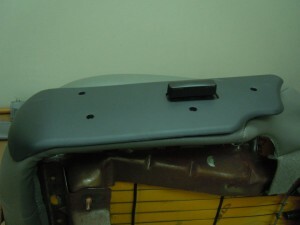 Flip the cover over and attach the J clips to the metal seat pan to tightly secure the leather cover. The long J clip that runs around the front will be the hardest to secure. Get the middle of this clip fastened to the seat pan first, and then move around to the sides. Step 5: The next step is to make the cut in the side of the cover for the power controls. Due to the many different power options available, we do not pre-cut any of the holes in the side for the power controls. Start by making a small, straight cut with the scissors in the side of the vinyl (shown below). You can peer through the vinyl and how for forward and back you need to cut, holding up and using the power control panel as a guide. Take your time, and make small cuts. Remember, you can always cut a little more off! The vinyl on the side skirting will also stretch a bit, allowing you to make a little smaller hole than what is necessary to push the panel through the side. Reconnect the 2 power connections back up, and push the panel through cut hole of the vinyl side skirting. Screw the 5 screws back through the power control panel fastening it back to the seat pan. Make sure you do not over tighten the screws and crack the plastic panel. Step 6: Reattach the recovered seat pan to the seat frame by lining up the round plastic tabs with the cut out channels in the seat frame. Push the seat bottom down, securing the tabs, until the fixed bolts on the seat pan line up with the holes on the seat frame. Tighten the (2) 13 mm nuts that hold on the seat pan. Reconnect all of the power connections that were previously unplugged to their appropriate receiver. 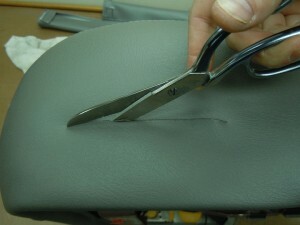 To ensure a good color match, take this time to clean your existing OEM leather using The Seat Shop’s cleaning method. You can find this cleaning video on our website at www.theseatshop.com. Apply Lexol leather conditioner to your new and old seat covers after cleaning. 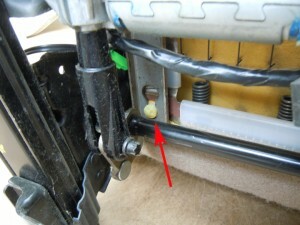 Reinstall the finished seat into the vehicle, and tighten using the (2) 15 mm nuts and the (2) 11 mm bolts. Connect the power and airbag (if applicable) plugs from the floorboard to the seat, and enjoy riding on your new leather replacement seat cover! For more in depth installation instructions, you can always check out our install videos on our website at www.theseatshop.com. If you have any questions about our factory match replacement leather seat covers, please visit us on the web, or feel free to give us a call at 214-710-2565. We are always happy to answer any questions you may have.